We have several ways to make it easy for you to customize our products, including custom-printed ribbon and wraparound sleeves. We can also print text on satin ribbon, up to 37 letters and spaces, or a logo up to 5” wide and 5/8” tall. 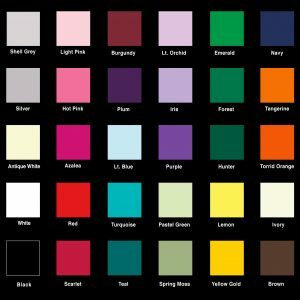 Customized text requires a lead time of approximately 2 weeks, and customized logo art requires a lead time of approximately 3 weeks. We can sometimes accommodate a faster turnaround time with rush charges. All of the ribbons we use are premium satin, and 7/8” wide. Minimum quantities apply. Many of our products have a wraparound sleeve, and we can custom-print the sleeve for those products with your custom information. Your company name or event can be printed on the front of the sleeve, and we will supply nutrition and ingredient information for the back. Minimum quantities apply, but we are able to accommodate fairly small numbers with adequate lead time. For all of our customizable options, additional charges and time are required. 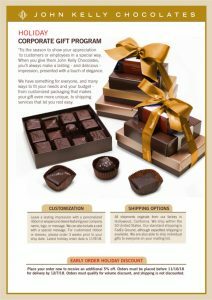 Please call us at 800-609-4243, or contact us at service@johnkellychocolates.com with the details of your order, and we will be happy to explain the costs, timing and artwork specifications. They All Love John Kelly. Perhaps you need to show your appreciation in a special way, or perhaps you just want to add a touch of elegance to make an even better impression. One thing is for sure: when you give them John Kelly Chocolates, they’ll notice.